I’m going to a party. For a moment, it crossed my mind that I had to pick you up. swim – an exercise in remote intimacy, performed and devised by Avatar Body Collision, is a cyberformance that delves into the possibilities and problems of intimacy without physical proximity. "swim" was premiered on 6 December 2002 at Medi@terra (Athens, Greece). "swim" offers an illustration of the integration of form and content directly inspired by the cyberspace environment. Like the cyber-relationships that inspired the work, "swim" is staged in the watery world of cyberspace, using online chat technologies to weave layers of virtual characters, avatars, web cam images and audio with a live stage performer. The evolution of the internet as a channel for human-to-human communication has facilitated the emergence of cyber-dating, of intimate relationships between people who are not physically proximal to each other. These relationships are constructed through words, images, glimpses, moments of intense connection and abrupt disconnection. Magical synchronicity can be shattered by technical failure, and lag can transform romantic seduction into ridiculous stuttering. Avatar Body Collision's artistic motivation is to explore the shadowy interface of theatre and the internet, experimenting with the creative potential of the internet as a space for live performance. The tools of cyberformance — including free online chat applications, email, digital images, text, and synthesised speech — are also the tools of cyber-dating. These tools enable tenuous relationships that can be frustrating as well as rewarding and productive: it's a connection of minds through the fingertips — simultaneously tactile and platonic - a shared fantasy. There one moment, gone the next — the magic is in the moment of connection/creation. "swim" is presented on a theatre stage or performance space to a proximal audience, with iVisit (an audio-visual web conferencing application) and the Palace (a graphical chat application) projected from my laptop to a screen or wall. It is a non-narrative collage of material drawn from real cyber-relationships and developed through online devising processes. The multiple stages — web cams, graphical avatars, and live stage performer — allow differentiation between characters and worlds at the same time as creating intricate links between the ideas and stories. Everything happens in real time - nothing is pre-recorded. I, Helen, appear on stage, in a role that hovers between technician and medium; through me, the audience access the intimacy of cyberspace. I begin the performance with a ritualistic "laptop dance" that conjures up my remote collaborators, who appear as faces in web cam windows from ambient locations. In my fluid role, I am also one of these ethereal figures. We choose to reveal or hide as we please. The audience sees only close-ups of our heads and hands, and glimpses of other body parts – yet my presence on stage, performing to my web cam, insists that we are indeed real flesh and blood women. Despite the geographical distances, we are very really together in the performance: at one point, Leena (who is actually in Helsinki) leans out of her web cam and removes Karla's glasses. Karla (who is actually in London) responds by letting down Leena's hair, and the two women touch each others' bodies across cyberspace, playfully and sensuously, finishing with a kiss. The paradox of distance and intimacy is echoed in the paradox between new technologies and old mythology. We swim across cyberspace to make our art and meet our lovers, drowning in data, in fear, and in the hopelessness of our actions. If we think we are doing something new, we are mistaken; we are simply repeating timeless patterns with modern technology. Turning back the pages, we find Hero and Leander, Hinemoana and Tutanekai, and others who struggled across great distances in search of intimacy. The difference is that in today's world, we claim agency: we don't like the ending where everybody dies, we want a happy ending. We have the privilege (authorship, authority) to write our own ending … or do we? What if I don't like your smell? What if we don't get on very well? The cartoonesque 2D avatar world of the Palace is designated as a stage for story telling. In our web cam windows, we paste up still images of the avatars we are manipulating in the Palace, signifying the connection and the difference between these two online stages. Images of popular singers and movie stars have been appropriated as avatars to re/present the characters, recontextualising the ancient myths within the contemporary world. 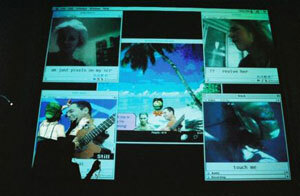 The avatars speak in computerised voices, spouting flippant one-liners commonly found in chat-rooms and employing humorous visual props and digital slapstick, transforming classical tales into a 21st century version of Commedia dell 'Arte or vaudeville. The avatars' thoughts, which are silent and appear visually in a thought-bubble rather than a speech-bubble, are used to send up and comment on the action in the same manner as Shakespearean asides (thoughts in the script extracts below are identified by a second : at the start of the line). Narrator: and a handsome youth, Lee-ander. Leander: Who is this vision before me? Hero: :no need to fish for compliments with this one! Spelling and punctuation are altered to manipulate the synthesised voices, and the characters consciously reference the technical environment, joking about typos and ad-libbing when lag rears its unpredictable head. Toot: My family is calling — I must return to the island. Hinny: Will we meet again? Slave: : what's that boy up to? Toot: I will play my lute, and you will hear it across the water. Slave: : is that a typo? Slave: : I thought it was meant to be a flute. Hinny: I will dream of you! With each of the five performances of "swim" to date, we have encountered different technical obstacles, in some cases almost forcing us to cancel the performance. Yet each time, sometimes at the very last minute, everything has worked. internet connections miraculously come back, crashed computers restart smoothly, misbehaving software becomes compliant, blocked chat rooms open their doors. It's impossible not to believe in some kind of spiritual energy generated by the desire of the four performers to connect and give the performance. We acknowledge that our work is risky, dependant as it is on the unreliable infant technology of the internet, and we don't even try to predict what new problem will be thrown at us next. This instability is integral to the magic of cyberformance. In a different show, "Lagging with the Lololols" (Virtual Minds Congress, Bremen, 12 March 2004), we had the rare experience of no technical problems at all. 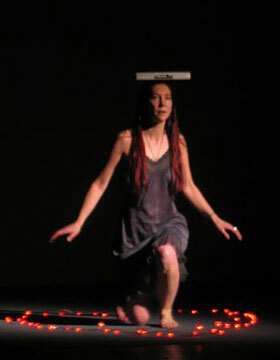 The performance was so smooth that the audience had trouble convincing themselves that the online performers were actually appearing in real time and not pre-recorded. Live performance is about sharing a unique experience, something that will never happen again, not in exactly the same way. Cyberformance (and cyber-dating) is especially temporal. 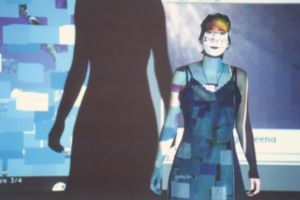 In each performance, lag occurs at different moments, different things are lost in the ether, web cam images freeze at random, and sound comes and goes. With each performance of "swim,” we become more confident with the medium and we make refinements based on how the audience has interpreted what we offer them. Each performance, like each relationship, exists for its own moment and with its own characteristics. Don't mourn it when it's gone. Creating artistic work with a group of people who have never been in the same physical room together, let alone the same country, is not unlike falling in love with someone you can only contact through cyberspace. The relationships exist in a murky, intangible netherworld, demanding great faith and trust, and enormous patience with the hardware, software, keystrokes, wires and raw data that make it all possible. In return, we are given the opportunity to craft, share and admire something awesome and profound. We’re going to a party.